What do Brazil's top beauty brand, America's second-fastest-growing restaurant chain, and the world's third bestselling car have in common? They are shattering the myth that acting sustainably and building a billion-dollar business are mutually exclusive. Green Giants examines nine companies that are merging social responsibility with wild profitability-and reveals the six factors responsible for their success, including: Iconoclastic Leadership fueled by deep conviction and a rebellious streak * Disruptive Innovation that uses sustainability to spur the development of radically better products and services * A Higher Purpose that ignites the company-when the mission leads, profits follow * Mainstream Appeal with positioning and packaging stripped of the crunchy clich's that alienate the average customer. This new breed of billion-dollar businesses proves it's possible to achieve enormous success while implementing sustainable principles that help consumers live better lives. Ranging from start-ups to business lines incubated within major multinationals, these companies collectively represent over $60 billion in revenue. What's more-many command wider profit margins and are growing faster than their conventional counterparts. 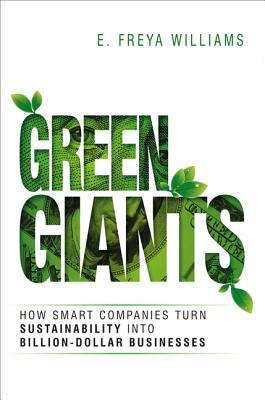 Packed with eye-opening research, exclusive interviews, and enlightening examples from Chipotle, Toyota, Unilever, Tesla, General Electric, and more, Green Giants serves as a blueprint for sustainable success that anyone can follow. E. FREYA WILLIAMS advises organizations, including Coca Cola, Kraft, SAP, and the UN, on how to incorporate sustainability and social good into their brands. The co-founder of OgilvyEarth, she is now CEO of Futerra, North America, and also served as EVP of Business+Social Purpose at Edelman. Her expertise has been featured in Newsweek, The Financial Times, and on NPR.